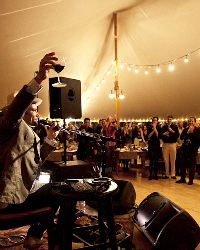 Food, wine, and music belong together. Join us as some of the world's premier musicians, chefs, and winemakers come together to create unforgettable experiences in Napa, Nashville, and Tuscany. 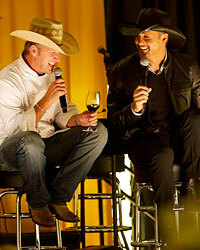 Chef Tim Love, music legend Tim McGraw, and winemaker Joel Peterson take inspiration from each other's talents as they collaborate for a memorable evening at Union Station in Nashville, TN. 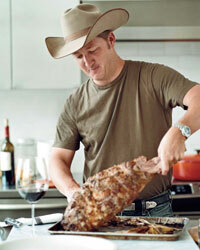 The unofficial mayor of Fort Worth, TX, Tim Love has become a nationally recognized culinary personality, known as much for his freewheeling personality as his signature urban western cuisine. Through his restaurants and work in the community for such causes as the NICU Helping Hands Foundation, Love has become the de facto culinary ambassador for the state of Texas, always doing his fans and family proud. Tim McGraw has sold over 40 million units and dominated the charts with 31 #1 singles. With 7.8 million spins at radio, he was the most-played artist of the past decade. McGraw has won three GRAMMY awards, 14 Academy of Country Music awards, 11 Country Music Association awards, 10 American Music awards, three People's Choice awards and numerous other awards. One of California's true wine pioneers, Joel Peterson unwittingly embarked on his winemaking journey at age 10 when he began tasting with the San Francisco Wine Sampling Club, organized by his father. After graduating from Oregon State University, Joel became a research immunologist, wine writer and consultant before learning the art of traditional winemaking. In 1976, Joel co-founded Ravenswood Winery and an American icon was born. Serving as Ravenswood's head winemaker for the past three decades, Joel has made more than 250 wines rated 90 points or greater and shepherded Ravenswood from a small, unknown winery producing 327 cases of Zinfandel to one of the most recognized names in California winemaking. Go behind the scenes as Chef Tim Love, music legend Tim McGraw and winemaker Joel Peterson create a special evening of food, wine and live music at Union Station in Nashville, TN. 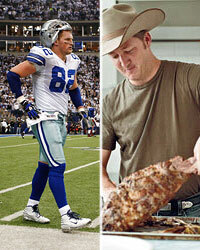 Tim Love discusses his cooking inspirations. Winemaker Joel Peterson discusses his wine pairing philosophy. Country music star hosts a soup party. The rocker and farmer-vintner promotes sustainability. NYC's world-class music venue with great food. The rocker and his wife make olive oil and honey in Tuscany. F&W honors a former rocker making excellent wines in Washington State. 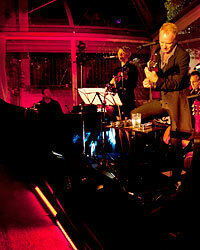 Wine-themed songs like UB40's Eighties hit "Red Red Wine" and "All the Wine" by indie rock group The National. Draws from mixes her musician husband, Mac McCaughan, made for the restaurant Lantern. An eclectic list ranging from rocker Pete Yorn's "On Your Side" to indie favorite Rilo Kiley's "Silver Lining." From Al Green to Coldplay. Mellow classics from jazz greats like Nat "King" Cole to the smart lyricism of folk-pop group The Magnetic Fields. Celebratory songs like "Birthday" by The Beatles and "These Are Days" by 10,000 Maniacs. Odes to summer like Angélique Kidjo's "Summertime" and other feel-good songs like U2's "Beautiful Day."